Catholic Charities of Southeast Michigan (CCSEM) is grateful for the support of organizations like Walmart, Bank of America, and United Way and NEXUS, whose grant money supports the work of our ministries. This past spring, the Walmart Foundation renewed its grant in support of Catholic Charities, providing $35,000 for a region-wide outreach effort to make the residents aware of the Federal Supplemental Nutrition Assistance Program (SNAP) and to provide enrollment assistance to eligible low-income families and individuals, including seniors. SNAP is a domestic hunger safety net program that works with the state, nonprofit, and private sector partners to improve awareness and access to better nutritional and health food choices. Many limited-income individuals and low-income families in southeast Michigan do not know about this resource, and CCSEM uses the funds to conduct region-wide awareness efforts and provide enrollment assistance. This fall, Bank of America continued its support of our All Saints Soup Kitchen and Food Pantry with a grant of $32,500 to help us alleviate hunger in the southwest Detroit neighborhoods where we serve. With support from organizations like Bank of America, our soup kitchen annually provides more than 16,000 hots meals, and our food pantry provides groceries for more than 183,000 meals a year. 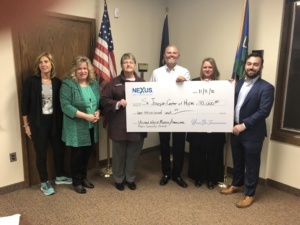 Finally, through a partnership with United Way of Monroe/Lenawee Counties, NEXUS Gas Transmission awarded $10,000 to support the new CCSEM Saint Joseph Center of Hope crisis intervention center in Monroe, to serve those suffering from drug addiction.